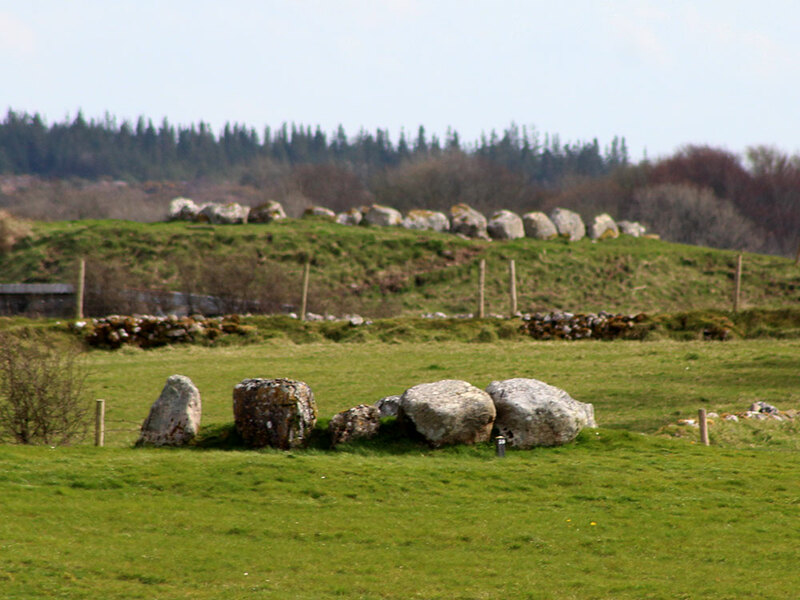 The type of monuments found at Carrowmore are stone circles bounding a raised platform with a central dolmens connected to the circle by a passage. 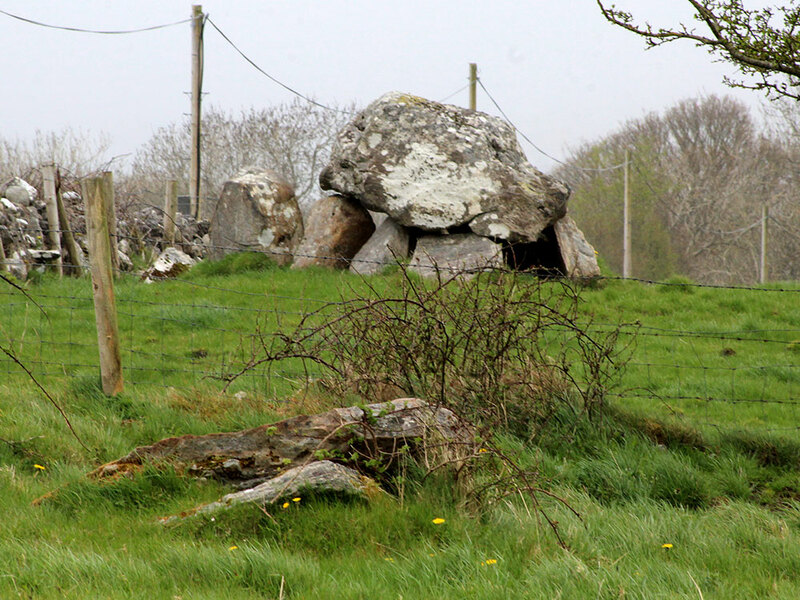 They are the earliest type of chambered cairn, or passage grave, to be found in Ireland. 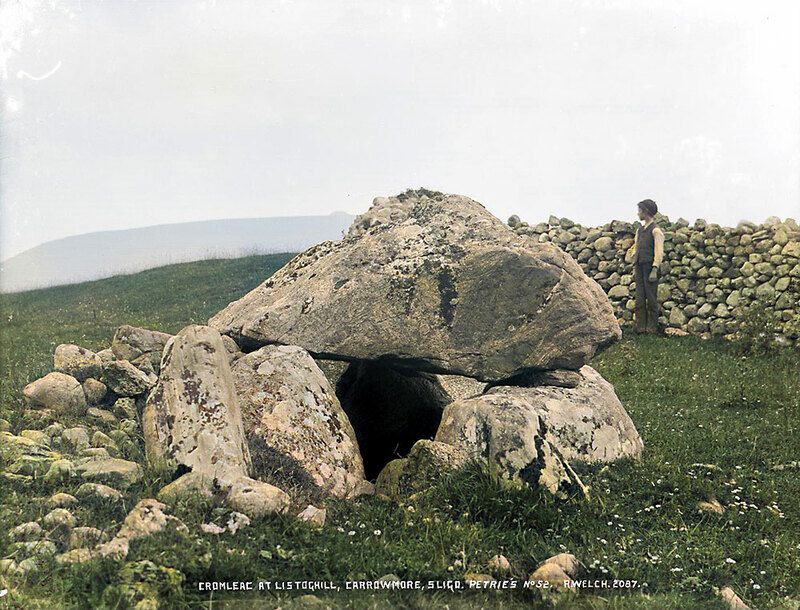 The Kissing Stone, Circle 7 at Carrowmorre in County Sligo. The stones that were used to construct the monuments are a very hard form of local stone called gneiss, which comes from the nearby Ox Mountains. There are an average of 30 to 35 stones in each circle, set side by side. Some of the stones are placed on a stone packing, which kept the tops of the stones level. The average circle diameter is 10 - 12 meters, though a few, such as 19, 22, 27 and 51 are larger. Carrowmore 7 by G. Elcock. Carrowmore 7 is the best example remaining today, but public access to this monument is not currently permitted. It consists of a circle of boulders about 11 meters in diameter, and has a beautifully graceful dolmen, or stone table at the centre. The sockets of missing stones were found during the excavations, which show that there was once a short passage leading into the chamber. 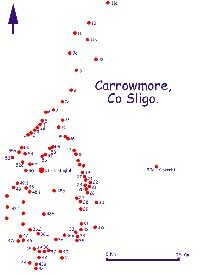 About 14 of the circles have passages at Carrowmore. 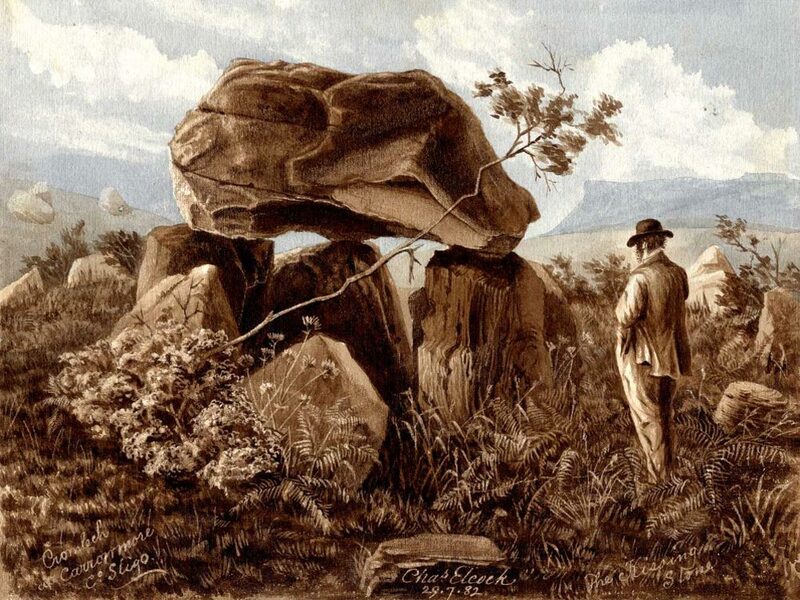 Wakeman's illustration of site 37 showing the dolmen and circle, with another circle beyond. Image copyright Sligo County Library. Some of the larger boulders were split in half, a feature that can be seen in the chamber of site 27. The rock is rich with veins of quartz, and was brought to the site not by hand, but by retreating glaciers during the ice age. Several fields of gneiss boulders lying as they were dropped by the galciers can be seen from the path up Knocknarea on the left (west) side, and gives an impression of what Carrowmore looked like before the circles were built. The Coolrea peninsula where Carrowmore is located is limestone covered with a mantle of glacial gravel. The complex is located on a plateau at the centre of the peninsula, with the circles built around the edge. Some limestone slabs were used in the monuments, but not many compared to the gneiss boulders. A good example if the massive capstone on the chamber at site 51, which is thought to have been quarried at the Glen on the south slope of Knocknarea. Some loose limestone slabs may have been used as roofing for the passages (again there is a good example at Site 27). 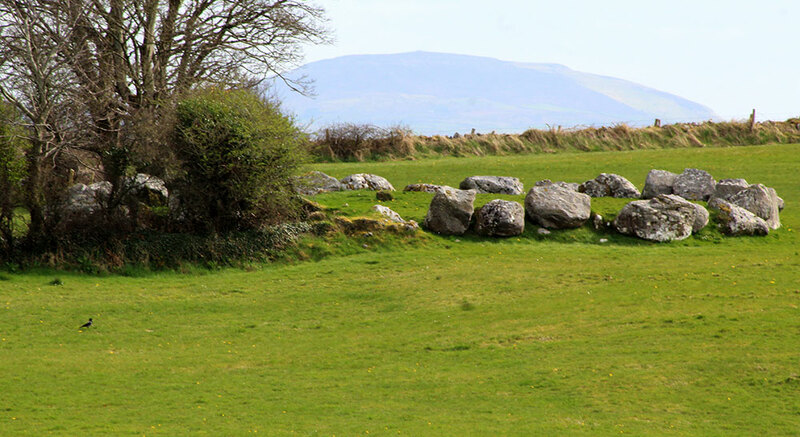 Fragments of quartz were found in some of the circles, and these would have come from the Ox Mountains to the south, specifically from the area around Croughan. One small piece of rock crystal had a hole drilled through the end and was used as a pendant or pendelum. Circle 26 beyond Site 59 viewed from Dolmen 4. 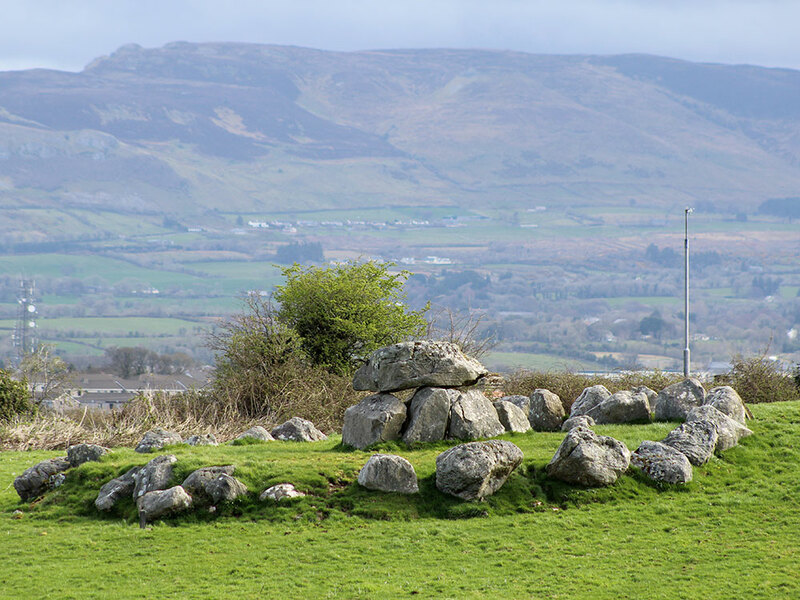 There is no evidence of cairns or mounds covering the chambers of the Carrowmore monuments, which appear to have been freestanding, as some are today. Several of the sites, however have a raised platform which can be up to a meter above ground level. Circle 57 and Kesh Corran.